It was in the 40's today. Our 12 inches of snow is melting quickly. Ma brought me in a bowl of clean snow. I love to lick on snow. Its as tasty as ice. I loved my bowl of snow. Makes me wish winter would stay around, sorta. I look forward to the green grass, the squirrels giving me a good chase and playing poodle ball (fetch) until the sun goes down. I look forward to hanging out in the Dogzebo (gazebo), listening to the sounds of the waterfall from the pond and the crickets singing their songs while relaxing with ma. I will enjoy my bowl of snow. 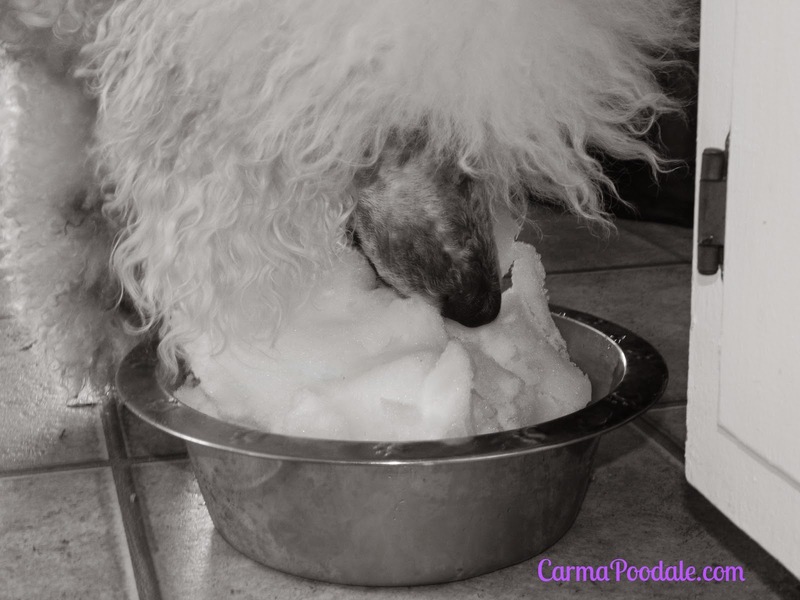 We love your pawsitive attitude Carma! May as well enjoy the snow until spring comes! Purrs from Deb and the Zee and Zoey Gang! This morning when I went out the birds were singing, the squirrels were chattering and its a beautiful blue sky type of day. Ma even went out without a jacket and there is still snow on the ground. Spring is around the corner and I can't wait. I hope it was all white snow, and not the dreaded yellow snow, Carma. I can't believe your mom will go outside and get you a bowl of snow. That is cool! No, it was clean snow. She gets the snow that has no footprints or anything in it. She went out and got me another bowl this morning. I love snow so much and in the summer I enjoy shaved ice. Come to think of it, yes i do. I find something in each season to look forward to! I hope your warmer weather reaches us, Carma! We could use some melt as we woke up to a leaking roof!! We have a metal roof and its been dripping too. So much snow melting so fast has made the water look for cracks. Hope they can find your leak soon. BOL! Love that bowl of snow but we can't wait for Spring to arrive! It sounded like spring outside this morning with all those birds chirping for their seed. It will be here soon!! All I see is huge puddles of water. Ma tells me not to think about it every time I go out. She knows I secretly want to be a mud runner. BOL! I never thought of doing that, and I bet Luke would love it! We feel like spring is coming soon, but there's a lot of snow to melt here yet. It's actually snowing out right now! If he likes to lick on snow , he would love it. Ma has brought me a couple of bowls today. She says at least she knows I am getting enough liquids. BOL! My dogs would love a bowl of snow! I would love to have more snow. It's so much fun to romp and roll in but Mom says the last big snowstorm that brought over a foot will be all gone in a few days. One last walk in it - please? At least someone appreciates the snow. I think the humans are tired of it!